Charred Skeever Hides can be collected from charred skeevers found roasting over bonfires, typically found in bandit camps or giant camps. However, you cannot cook skeevers yourself to create hides. 14% chance of 1-3 samples being carried by Silver Hand members (encountered during the Companions questline). 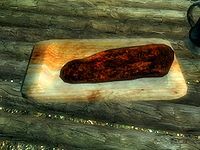 Charred skeever hides are also categorized as food, meaning they can be sold to innkeepers as well as apothecary merchants. This page was last modified on 9 April 2018, at 03:42.